The secret to effective skincare is knowing what’s effective. Vitamin A is essential to achieve, as I call it, the ACE Face (Vitamins A, C & E). These vitamins serve to exfoliate, rejuvenate, and restore the skin. Let’s dive into the secret of retinoid. 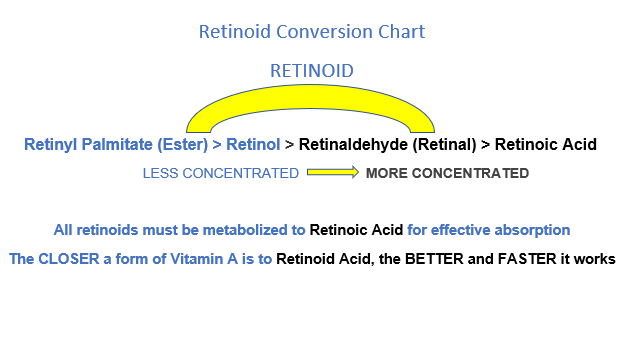 Retinoid is an umbrella term to describe all forms of Vitamin A. It comes both naturally and synthetically produced derivatives. Retinoids has been in the dermatology game for more than 70 years. Retinoids are very well known to influence a variety of cellular processes, such as skin growth, function, and balancing the skin barrier. Trans Epidermal Water Loss (TEWL) is minimized to maintain the skin’s hydration. Retinoids is used to treat skin conditions such as plaque psoriasis, acne, oily skin, actinic keratosis (scaly, precancerous skin lesions) and photoaging from UV rays. Retinoids can break down after sun expose that could lead to free radicals. Even though sunscreen is needed daily, I suggest using it as a night treatment to be more effective. It is important to note that Vitamin A cannot be synthesized (produced) by the body; hence it needs to be supplied to the body in a such as topical products, vitamins and food. 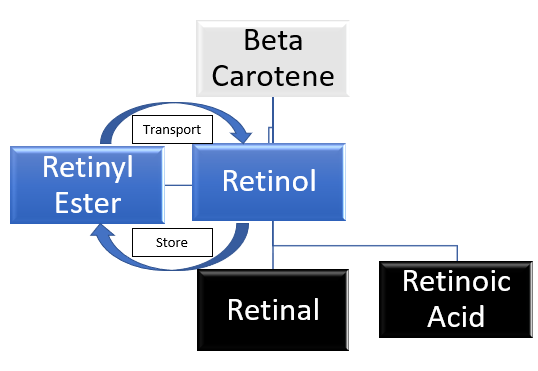 All retinoids are originally derived from beta-carotene. It’s converted to retinyl esters (storage form) then to retinol (transport form). The retinyl esters are transformed to retinol (metabolized to water-soluble retinoic acid) before absorption from the intestine and back to retinyl esters for storage in the liver. In the plasma, retinol is bound to plasma-retinol binding proteins that which stimulates collagen, making new skin cells. Whew! Ok, I hope I broke it down enough to see the differences and the importance of Retinoids. Your current skin condition will determine which is the right one for you. Great addition to the Fall Season. Now that you know your options, choosing and agreeing to the most effective option should be easier for your desired skin goals. 5 Ways Hormones Can Impact the Skin Many will. What is rosacea? Rosacea is a chronic disease that affects the blood. What’s in your Bottle? As fast as we hustle through our days,. Understanding acne: Let’s talk about…ACNE For some people, this could be a. The use of carrier oils is gaining popularity due to its natural.